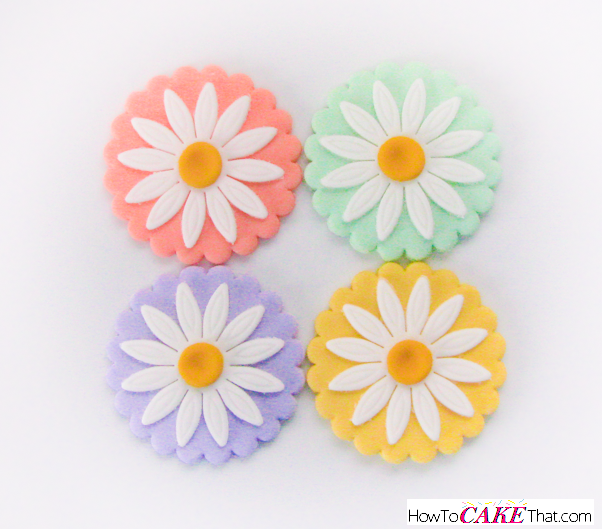 How CUTE are these pastel daisy cupcake toppers?! They are perfect for dressing up cupcakes at a lovely spring wedding or the perfect decoration to match a pastel theme baby shower! Or maybe you're looking for that special decoration to top the Easter cupcakes you'll be giving to family and friends to celebrate the holiday! Whatever event you choose to use them for, I'm sure the recipient will be thrilled! And the best part about these toppers is they are so quick and easy to assemble! All you need are a few simple tools! Let's get started! 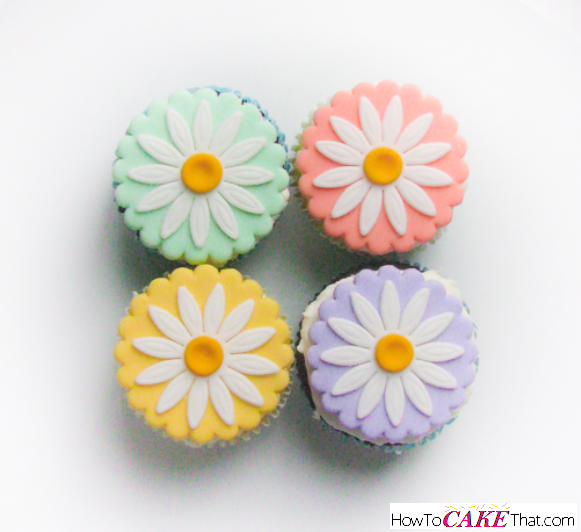 For this tutorial, our fondant will need to harden a bit to be sturdy enough to place on top of the cupcakes without wilting. I recommend using a blend of fondant and gum paste (either 75% fondant to 25% gum paste or 50/50 if you want it to dry faster and firmer), or you could just mix Tylose powder into plain fondant. 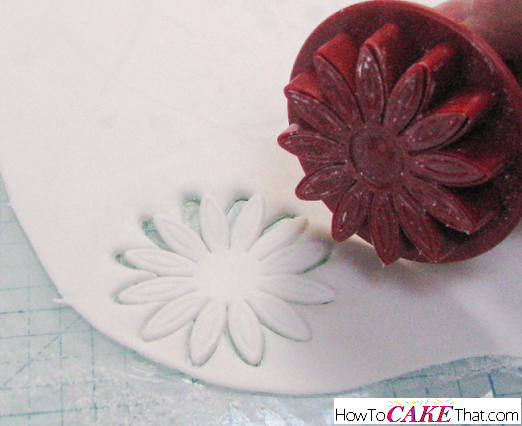 For this tutorial I am just using fondant with a generous amount of Tylose mixed in. 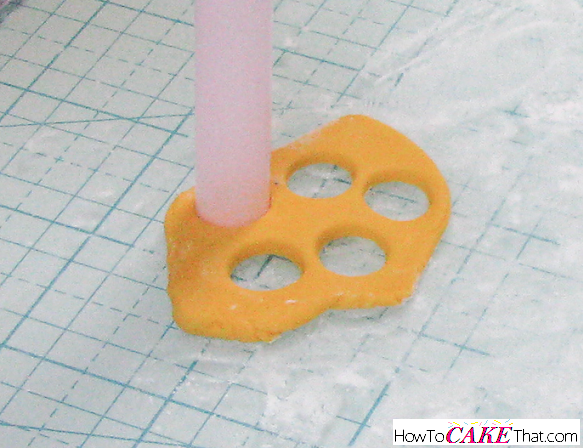 Whatever blend you choose, I will be referring to it as "fondant" in this tutorial. I will be decorating standard size cupcakes, so the measurements I will give you of the tools I am using will be suitable for creating fondant decorations for standard cupcakes. To begin, roll out white fondant into a thin sheet. 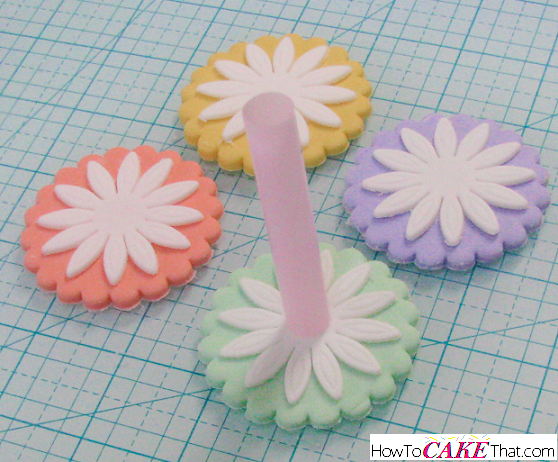 Use a daisy plunger cutter to cut out enough daisies for your project. Set daisies aside to dry. Next, color fondant to desired colors to use as the background for the daisies. I chose to use Wilton gel colors in Violet, Kelly Green, and Creamy Peach. And the yellow was Chefmaster gel in Golden Yellow. 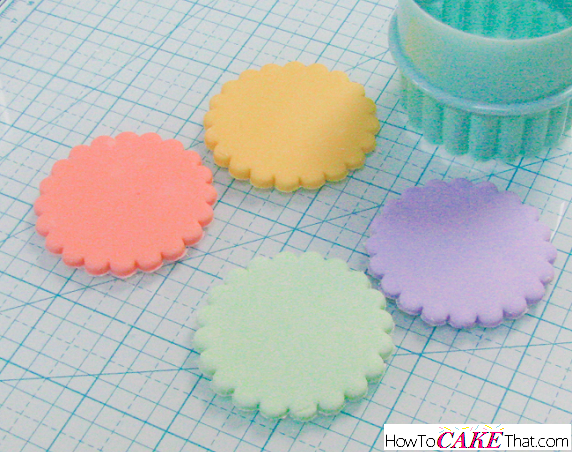 Roll out the colored fondant thick enough to make the disks sturdy, but thin enough so that it's not bulky. I like my fondant disks to be about 1/8 of an inch thick. Cut out disks using a 2 1/4 inch round scalloped biscuit cutter. Next, flip one daisy at a time so that it is face-down. Lightly brush the back of the daisy's center with a tiny bit of water. 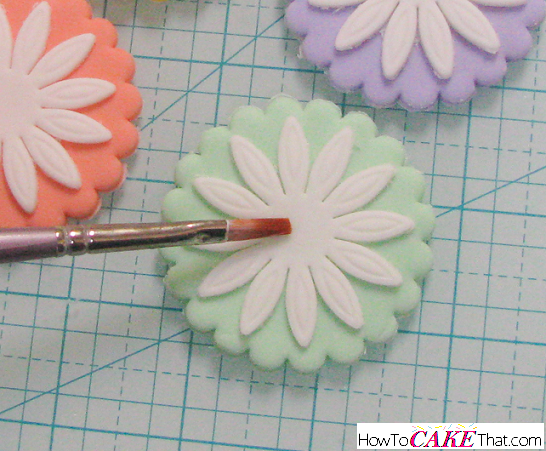 Flip the daisy upright and place onto a fondant disk. Repeat steps until all daisies have been "glued" onto a disk. Now it's time to create the little yellow daisy flower centers. I didn't have a round cutter small enough for this task, so I decided to use a large tea straw as my cutter. As you can see by this photo, the tea straw is a bit smaller than the center. But we will be forming the center to become a perfect fit for our daisies. Using the Chefmaster gel in Golden Yellow, I dyed the leftover yellow fondant a bit darker than what was used for the background disk. 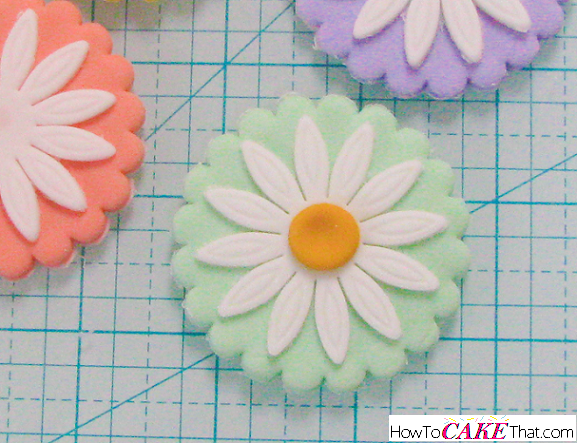 Next, I rolled out the dark yellow fondant and cut out the same number of circles as daisies. 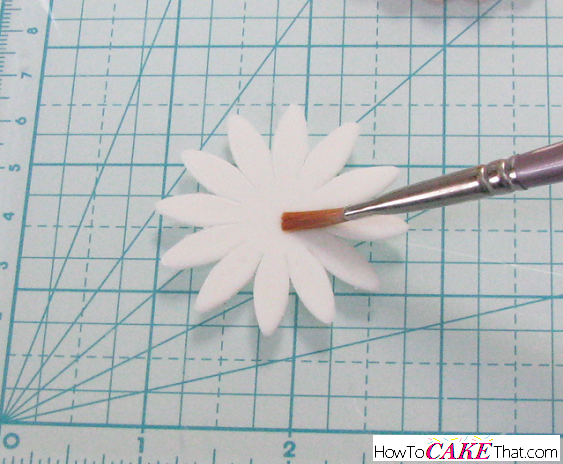 Next, using a metal ball tool, gently press into the centers of the flower centers. This will help widen them to make them fit the flower better, and also it gives it a more realistic shape! Brush the center of the daisy with a tiny bit of water. And place the dark yellow flower center onto the daisy! The tall edges of the flower center can be gently pressed down with your fingers if your flower center needs to be widened a bit more. Repeat these steps with the remaining flowers. 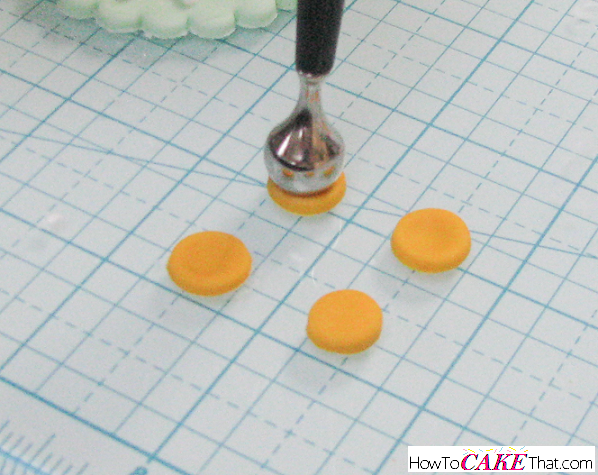 Allow fondant toppers to dry overnight. Once dried, they can be placed on frosted cupcakes to dress them up! I hope you have enjoyed this tutorial! God bless!